*Tuesday: Pizza Pockets--use your favorite dough & sauce, and any toppings you like. Wrap the sauce, cheese and toppings inside of the dough (making sure to seal the edges tightly), and bake on a rimmed baking sheet until cooked through. Preheat oven to 350*. In saucepan over low heat, combine caramels, butter and milk. Cook, stirring frequently, until smooth. Remove from heat. Set aside. In large bowl, combine sugar, eggs, vanilla and salt. Gradually mix in melted caramel mixture. Stir in pecans. Pour filling into unbaked pie crust. Bake in preheated oven for 45-50 minutes, or until pastry is golden brown. Allow to cool until filling is firm. In large bowl, combine cream cheese, sugar and vanilla. Beat until smooth. Blend in eggs one at a time. Remove 1 c. of batter and spread into bottom of crust; set aside. Add pumpkin, cinnamon, cloves and nutmeg to remaining batter an stir gently until well blended. Carefully spread over batter in the crust. Bake in preheated oven for 35-40 minutes, or until center is almost set. Allow to cool, then refrigerate for 3 hours or overnight. Cover with whipped topping before serving. Last week I felt like I was finally in the fall/winter cooking mode. It was fun to cook/bake, and I loved trying some new recipes. Here's to another week! *Thursday: Asian Noodle Salad + a special request for some treats to take to work tomorrow for the last day of a loved rotation. I think I'll do these & these. Here's a super easy peanut butter pie recipe. It was yummy. I think next time I would definitely make a graham cracker crust instead of the chocolate wafer crust (a little weird since I love chocolate so much). And the texture was interesting. The gelatin definitely gives the pie some "bounce" as Burke put it. But the flavor was yummy and with the crunchy peanuts on top and a scoop of vanilla ice cream on the side, it was a delight. Preheat oven to 350*. 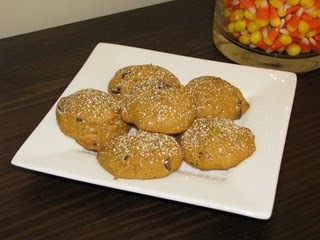 Process cookies in a food processor until finely ground (to yield 1 3/4 cups). Add butter, and pulse until crumbs are evenly moistened. Transfer crumb mixture to a 9-inch tart pan with a removable bottom. Press firmly into the bottom and up the sides. Place pan on a baking sheet; bake crust until set, 15 to 20 minutes; let cool completely. Meanwhile, place the water in a small saucepan (off heat); sprinkle with gelatin. Let stand until softened, 5 to 10 minutes. In a food processor, combine brown sugar and peanut butter; process until smooth. Add cream; process until mixture is light and holds soft peaks, scraping down sides of bowl as needed. Place softened gelatin over very low heat, stirring, just until dissolved. Add to peanut-butter mixture in food processor; blend to combine. Transfer filling to cooled crust, and smooth top with a flexible or offset spatula. Sprinkle with chopped peanuts, and chill until set, at least 2 hours and up to 3 days. In a a large saucepan, saute celery, onion and red pepper in butter for 5-6 minutes or until tender. Add tomatoes and tomato paste. Bring to a boil. Reduce heat; cover and simmer for 40 minutes. Remove from the heat. Stir in the basil, sugar, salt and pepper; cool slightly. Transfer half of he soup mixture into a blender/food processor. While processing, gradually add cream; process until pureed. Return to the pan; heat through (do not boil). Soften yeast in 1/2 c. warm water. Measure flour by lightly spooning into cup and leveling off. In large bowl (or mixer) blend sugar, softened shortening, salt, milk, 3/4 c. water. Add 2-3 c. flour and beat with mixer until smooth. Add yeast. Gradually add remaining flour to form a moderately stiff dough; working it in first with spoon and finishing on a floured surface. Knead until smooth and elastic (about 8-10 mins). Place in greased bowl, turning dough to grease all sides. Cover to keep air out; let rise in warm place until doubled in bulk. Punch down dough; cover and let rise until nearly double again. Knead to remove air bubbles. Dived into 2 portions and let rest 10 mins. Place in well-greased loaf pans, seam side down and covered. Let rise until dough is nearly doubled. Bake in 350* oven until loaves are golden brown and sound hollow when tapped, about 30 mins. Remove from pans immediately; cool on wire racks. Thanks to my Mother in law, every fall I enjoy my days a little more because of this recipe. In a large bowl, combine brown sugar, butter, egg, pumpkin and vanilla; beat well. Mix dry ingredients together, then add gradually to the wet ingredients blending thoroughly. Stir in chocolate chips. Using a TBLSP sized spoon (or small ice cream scoop), evenly space dough on cookie sheet. Bake at 350* for around 10 minutes. Sorry, but I am just one of those people who can't get enough of fall. I LOVE when the air begins to chill, and I can break out the sweaters/boots. And I even get a little excited for winter. Go ahead, hate me. But I like that I don't have to feel depressed half of the year because I'm cold. :) One reason the cooler weather is so amazing to me is all of the baking/cooking opportunities I can take advantage of now that it isn't so hot out! So get ready for some home-cookin' casseroles and lots of warm soups!!! I'm SO excited!!! *Monday: Never got around to our Salmon & Roasted Root Vegetables yesterday for dinner (we were too busy eating cinnamon rolls!). So we'll try it tonight!